IA12836 Features: -Presentation book. -Designed to lie completely flat while open. -Spine pocket allows for easy labeling. -Archival safe acid and PVC free. -Comes in 36 Pages. -Storing or presentation of a vast array of artwork and memory projects. Portfolio Type: -Portfolio Bag/Presentation Case. Product Type: -Art Presentation & Protection. Storage Compartment: -Yes. Dimensions: Overall Height - Top to Bottom: -11.5". Overall Width - Side to Side: -1". Overall Depth - Front to Back: -9.75". Overall Product Weight: -1 lbs. If you have any questions about this product by Itoya of America, Ltd, contact us by completing and submitting the form below. If you are looking for a specif part number, please include it with your message. 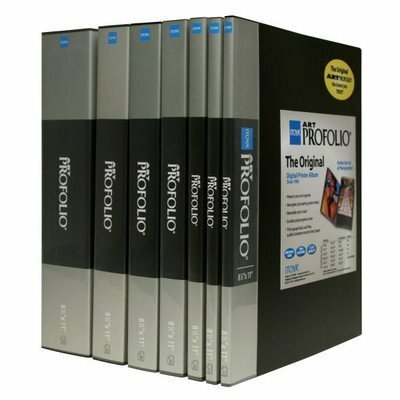 Art Profolio Evolution Presentation Display Book 9" x 12"